This skate has a rounded diamond-shaped pectoral disc, with a pointed snout that has translucent patches on either side of it. There are distinct dark eye spots with light outlines on its pectoral fins, but otherwise it is a dark brown on top, and white underneath. It is harmless to humans, but it has a row of denticle spines down its back and onto its stout tail, so it should be handled with care. Generally it prefers the sandy or rocky sea floors where it can hunt shrimp and other invertebrates. Common names in the English language include Texas clear nose skate, roundel skate, and rondel skate. Other common names include medaillonrog (Dutch), raie tourteau (French), raya (Spanish), raya tejana (Spanish), teksasinrausku (Finnish), and texasrokke (Danish). Presently this species is being caught by fisheries targeting other fish which is putting a strain on the roundel skate population. Currently no parameters are in effect to regulate the volume of roundel skates caught as “by catch” by these fisheries which is having detrimental effects on their population levels. Until parameters are set population is threatened to continue declining, possibly past recovery levels. The roundel skate is harmless to humans. Skates do not possess venomous spines although the row of middorsal thorns may cause injury to persons stepping on or picking up the skate. The roundel skate is not listed as endangered or vulnerable with the World Conservation Union (IUCN). The IUCN is a global union of states, governmental agencies, and non-governmental organizations in a partnership that assesses the conservation status of species. > Check the status of the roundel skate at the IUCN website. The roundel skate is found throughout the Gulf of Mexico in inshore waters and is most common in water less than 328 feet (100 m) deep. The roundel skate is found in marine waters along the shores and to depths of about 590 feet (180 m). This species resides on the ocean floor composed of mediums such as sand, broken shells, and pebbles. 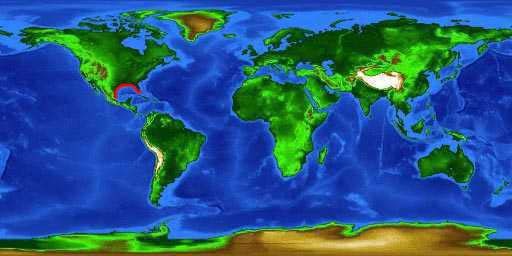 It is found in tropical climates where water temperature ranges from about 57 to 82° F (14 to 28° C). 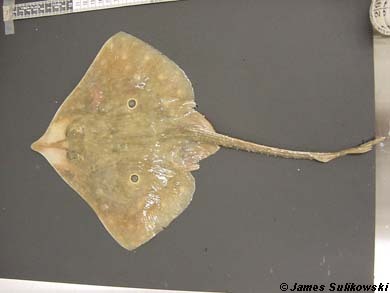 The roundel skate has a diamond-shaped disk with a clear region on both sides of its snout making this species distinguishable from other skates common to the Gulf of Mexico. On each pectoral fin a dark round spot surrounded by a pale pink ring can be discerned. The disk is diamond shaped with a middorsal row of spines although it lacks any scapular spines. 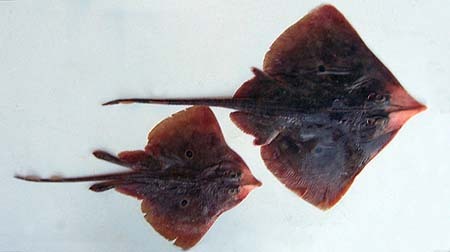 The dorsal surface of the roundel skate has a rich coffee brown coloring. Aside from the two pectoral spots the dorsal surface is free of any light or dark colored spotting although dark patches are often observed. The ventral surface is white in color. The teeth of the roundel skates consist of about 44 to 55 series of teeth in males and females, respectively. The females and young males have teeth with low cusps that are worn almost smooth in the older rows. Mature males seem to have slightly sharper teeth. In American waters, the typical hatchling size is about (11cm) in total length. In the Gulf of Mexico, The oldest observed male was 8 years, while females to 9 years were observed. Males mature at approximately 17 inches (44.0 cm) total length and 5 years of age while females mature at approximately 21 inches (53.4 cm) and 5.8 years of age. The roundel skate is known to feed primarily on small shrimps and crabs and occasionally other small crustaceans and fishes. The roundel skates are oviparous (egg layers) with a distinct sexual dimorphism between males and females. Copulationincludes a distinct pairing between the male and female where insertion of the male clasper into the female cloaca takes place. The ovaries of the female are functional on both sides. 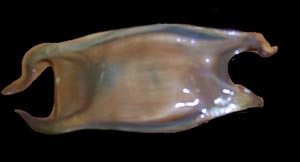 Once the eggs are mature and released from the ovaries, they get fertilized in the upper part of the shell gland, and get enclosed with yolk and albumen in a capsule formed by the lower shell gland. These capsules vary widely in size and are believed to be associated with parental body size. The capsules are light brown and have the characteristic horns on the four corners. Typically, there is only one fertilized egg found in a single capsule. These capsules are flat on one side and convex on the other. The female will often deposit eggs in sandy or muddy flats. The gestation period is unknown for this species. When the young hatch from the capsules, they are fully formed and are similar in appearance to adult specimens. Very little is known about the reproductive biology of this species. However, a study is currently under way to analyze the reproductive cycle of this species. 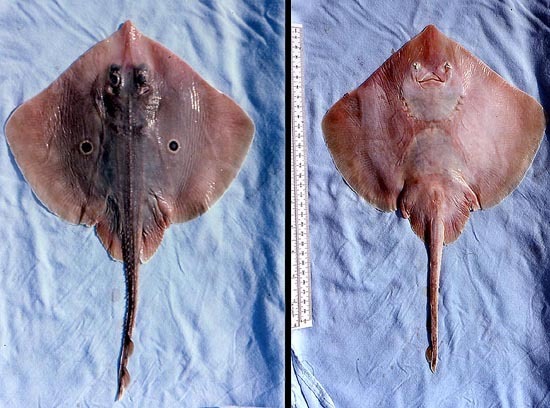 The roundel skate is subject to predation by larger fishes such as sharks and gag grouper. Egg capsules have been subject to predation by predatory gastropods. The roundel skate was described and assigned the name Raja texana in 1921 by A.C. Chandler. The genus nameraja is derived from the Latin “raja,-ae” meaning sting ray. There are no known synonyms used in past scientific literature referring to this species.